Free international calling service is hard to come by, after all, commercial telephone companies or phone communication operators need to pay connection fee to receiving called party’s providers no matter the calls are made to land line, cell phone or satellite phone, and regardless of it’s a trunk, toll or VoIP calls. Lots of sites that offer free worldwide phone calls has now defunct, e.g. AllFreeCalls. Most established PC-to-Phone or VoIP operators such as MediaRing gives free calls to limited countries or destinations as promotion to attract users. There is another opportunity for free international phone calls in from PC to phone style, by using Google Talk, and Talkster integration with GTalk2VoIP. The partnership, using ad-supported business model, allows callers from anywhere worldwide in every countries free international, long distance and group conference calls by leveraging on Google Talk. And callers able to call to more than 30 countries supported by Talkster’s network completely free, or partially free (caller portion) for anywhere else in the world. The free international calls by dialing from GTalk instant messaging client is especially beneficial to areas with strictly regulated VoIP and telecom practices, such as India, Africa and Middle East countries such as United Arab Emirates, where using Talkster through GTalk2VoIP will let people communicate freely between mobile phones, landlines and PCs, even in countries not currently supported through Talkster’s ad supported free calling service. Run Google Talk desktop client. Download and install Google Talk if you haven’t. Click on the Add button on Google Talk to add contacts into Google Talk, as the same usual way. The complete full phone number must include country code and area code. For example, a telephone number in UK will have the following phone number assigned in GTalk: 442071234567@talkster.gtalk2voip.com, or for USA, 12125551212@talkster.gtalk2voip.com. A confirmation instant message will be sent by Talkster for instructions together with a local Talkster call-in number on how to place the free international calls for both calling party and called party. Typically, Talkster assigns a local Talkster number for calling party (the person you want to call) in their country, which allows he or she to incur only cheap local call charge (which may be free in some countries). To place the free international call to your friend, click on friend’s number in the Google Talk Contact List. Click on the Call button to start the call. 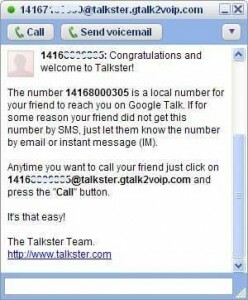 Talkster will dial out to the calling phone number from Google Talk. When the calling party answers, there is 10 seconds for caller to check to see if he’s available to talk, and to instruct the answering party to hang up and callback using the caller’s local Taskster phone number in that country. Wait while the calling party hangs up and calls back using the Talkster local number for the caller. Ensure that the calling party knows this number, else send the phone number to him or by email or IM. If the phone number is a mobile phone number, an SMS with Talkster call-in number will be sent to the cellphone too. The call recipient or the calling party must calls back in for the international call to be connected. Note that Talkster uses Caller ID to recognize who to connect the call to, so Caller ID must not be disabled or suppressed. As soon as the ‘original calling party’ calls in, Talkster and GTalk2VoIP connect both caller and called party into an international call where talkers can talk as long as you want for free. When finished talking, just end the call. Users are welcome to call as often as possible. Currently, Talkster has local numbers in more than 30 countries, including Argentina, Australia, Austria, Belgium, Canada, Chile, China, Czech Republic, Denmark, El Salvador, Finland, France, Germany, Hong Kong, Hungary, Ireland, Israel, Italy, Latvia, Lithuania, Luxembourg, Mexico, Netherlands, Norway, Peru, Poland, Romania, Slovakia, Slovenia, Spain, Sweden, Switzerland, United Kingdom and United States. 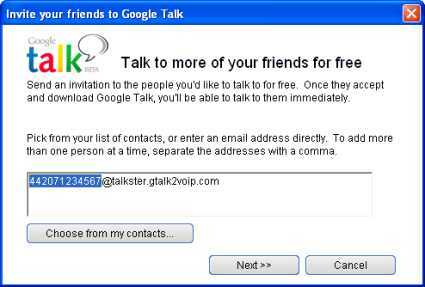 Calling fixed line, landline, mobile, cell or any phone number of supported international destinations or countries from Google Talk via Talkster and GTalk2VoIP integration is always free, and no credit card, no sign-up and no registration required, no catches, no limites, and no conditions attached, and free usage is unlimited. Users can can call as often as you like and talk as long as you like. More information at gtalk2voip.com.